Federal Member for Gipplsand Darren Chester pictured with Morwell Football Club representatives (from left) Sam Solomon, President Paul Spagnolo, James Jacobsen and Jimmy Quinn, who are looking forward to works commencing on a synthetic oval at Morwell Recreation Reserve. Construction of a $3.5 million synthetic oval at the Morwell Recreation Reserve will commence before the end of this year. The oval will be built on the old caravan park site behind the current football oval. 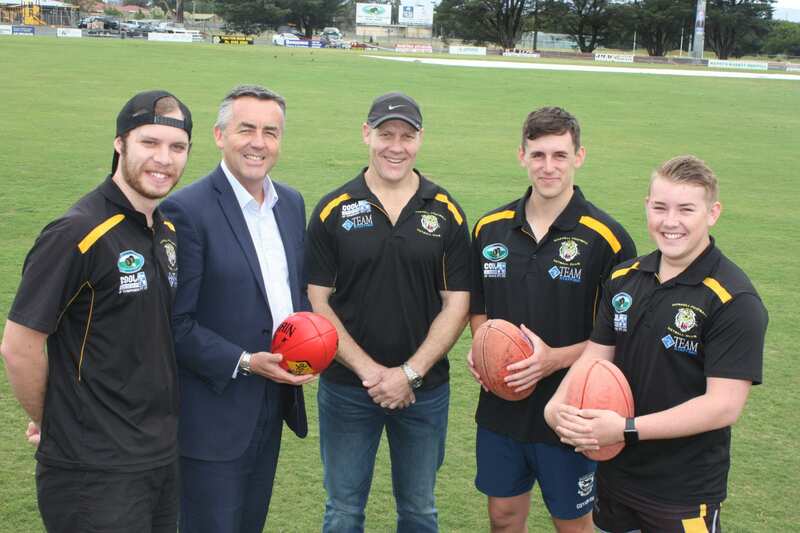 The Nationals Member for Gippsland Darren Chester announced $1.2 million toward the synthetic oval last year as part of the Federal Government’s $5 million commitment to upgrade the Morwell Recreation Reserve. Mr Chester also secured federal funding for new netball courts and a shared cricket-netball pavilion. Mr Chester said the synthetic oval with sports lighting would secure the region’s ability to bring AFL exhibition matches to Gippsland and create more opportunities to host regional and state competitions that bring people into Gippsland. “Tuff Turf will work with Latrobe City Council to deliver the project, importantly, council has asked that local subcontractors be used wherever possible to support local business,” Mr Chester said. The new oval will be built for AFL use and will include line markings for soccer and barrier netting. President of Morwell Football Netball Club Paul Spagnolo said the redevelopment would provide the club with some of the best facilities in the state. “We’ll have access to the synthetic oval for weeknight training when the weather conditions don’t allow us on the main oval and also for warm up on game day, which has always been a struggle,” Mr Spagnolo said. “It gives us access to state-of-the-art facilities and that will assist us in strengthening Morwell Football Netball Club going forward to become the community club of choice for both players and families. The synthetic oval is a part of a Morwell Recreation Reserve Project that includes new netball courts, change rooms and a shared cricket-netball pavilion. Mr Chester has secured $5 million from the Federal Government toward the upgrades at the Morwell Recreation Reserve.